Galway sheep are from Galway, in the west of Ireland. They were developed in the West of Ireland, as a result of the importation of English Longwools from the late 17th century onwards. From the middle of the 18th century Robert Bakewell's Dishley Leicester, also known as the New or Improved Leicester, was exported to Ireland in large numbers, in particular to the estate of Bakewell's associate, Lord Roscommon, and later Lord Sheffield. The breed which developed was for many years known as the Roscommon, and a Flock Book of Roscommon Long-Wool Sheep was established in 1895, surviving until at least the 1920s. 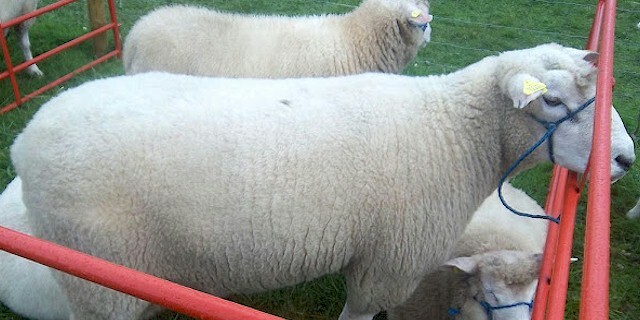 The Roscommon was a large, white-faced polled breed and, though classified as Longwool, did not have the very long staple characteristic of breeds such as the Lincoln and Leicester Longwool. They bore, as the Galway does, an almost uncanny resemblance to surviving prints and paintings of Bakewell's sheep, being perhaps, closer to the Dishley breed than any of the English breeds which were influenced by Bakewell's stock. A group of breeders in Galway founded the Galway Sheep Breeders Society in 1923, when the Roscommon breed society was ailing. The Galway Sheep Breeders Society was founded at Athenry, Galway. The society inspected over 200 rams and 6000 ewes, presumably sheep of Roscommon type (admitting 10 percent of these to the new register). A recording scheme started in 1969, which continues today, mainly aimed at improving prolificacy. The plan was started with the help of the Department of Agriculture and An Foras Taluntais (now Teagasc). Today commercial Galway sheep farming is relatively common in the west of Ireland. Galway are medium to large sized white sheep. Their face is completely white and there are a characteristic bob of wool on their head and wool on their legs. Their outer lips are dark and they often have dark spots on the ears. Both rams and ewes are usually polled. Their nostrils are of dark and wide. The rams usually have a bold masculine head. Their neck is thick, short, and their shoulders are well set. Their back is long and level with a strong wide loin. Their skin is usually light pink.